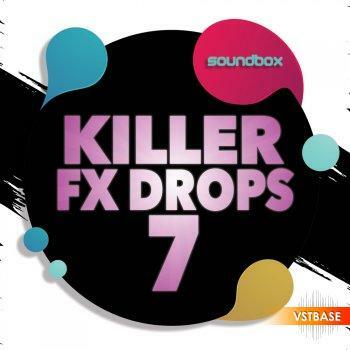 'Killer FX Drops 7' hosts 953 MB of killer FX crafted for all genres. In each of the Construction Kit folders you will find loops broken down into drops, fills, impacts, percussion, low end, risers, snare builds, synth FX, kick builds, FX, vocal FX and full mixes. Loops are key labelled where necessary to save you time when you are producing your next killer track. Huge crescendo-building risers, speaker-smashing drops and section-defining impacts make up just part of what is achievable from this fantastic collection. Make sure you stay ahead of the rest with the ready-to-drop FX loops by incorporating them into your breakdowns and section changes for that professional sound. Fans of Deep House, Techno, Grime, Tech House, Progressive, Dubstep, Electro and Glitch alike will find this huge selection of FX an absolute must for their audio weaponry. Music makers in the style of Stormzy, Showtek, Martin Garrix, Eric Prydz, Calvin Harris, Martin Solveig, Hot Since 82, Knife Party, Jack U, Rudimental and Gorgon City will find this FX collection a must-have. All 120 loops come as high quality 24-Bit WAV and key labelled where necessary.